Russian writer, educationist, and communal worker; born April 6, 1836, at Lukachi, government of Volhynia; died Oct. 22, 1894, at Jaffa, Palestine. He received his first education in the ḥeder and in the Russian public school at Turin, district of Kovel; in 1847 entered the gymnasium at Jitomir, and in 1848 the Hebrew Theological Seminary at the same place, graduating from the latter in 1858. He was appointed teacher at the Jewish school of Starokon-stantinov, and acted as rabbi of the Jitomir community from 1859 to 1862. From 1863 to 1867 he was instructor in the Jewish religion at various gymnasia in Jitomir. In 1867 Bienstok was appointed assistant editor of the "Volynskiya Gubernskiya Vyedomosty," the official newspaper of the government of Volhynia, and from 1867 to 1882 was adviser on Jewish matters ("uchony yevrei") to the governor of Volhynia. In 1880 Bienstok settled at St. Petersburg as secretary of the Jewish community there; but after the anti-Jewish riots he returned to Jitomir, and in 1892 the Russian-Jewish Aid Society for Agriculturists and Artisans of Odessa appointed him as its representative in Jaffa. There he brought order into the affairs of the society, and reported on the condition of the agricultural colonies of Palestine. Bienstok was one of the pioneer collaborators of the first Russian-Jewish periodicals, "Razsvyet" and "Sion." He also contributed to the Russian periodicals:" "Moskovskiya Vyedomosti," "Russki Vyestnik," "Sovremennaya Lyetopis," and others. Bienstok was the author of: (1) "Otzy i Dyety" (Fathers and Sons), a translation of the Hebrew novel, "Abot u-Banim," by S. Abramovich; (2) "Yevreiskiya Zemledyelcheskiya Kolonii Yekaterinoslavskoi Gubernii 1890" (On the Jewish Agricultural Colonies of the Province of Yekaterinoslav in 1890, (St. Petersburg, 1890). 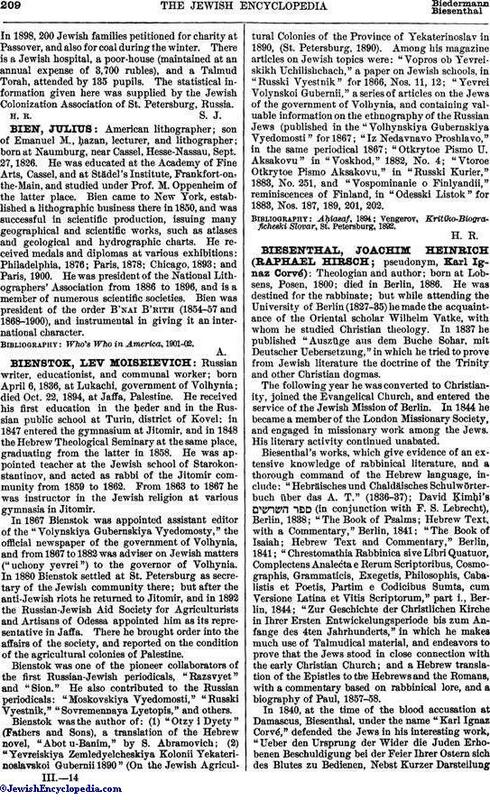 Among his magazine articles on Jewish topics were: "Vopros ob Yevreiskikh Uchilishchach," a paper on Jewish schools, in "Russki Vyestnik" for 1866, Nos. 11, 12; "Yevrei Volynskoi Gubernii," a series of articles on the Jews of the government of Volhynia, and containing valuable information on the ethnography of the Russian Jews (published in the "Volhynskiya Gubernskiya Vyedomosti" for 1867; "Iz Nedavnavo Proshlavo," in the same periodical 1867; "Otkrytoe Pismo U. Aksakovu" in "Voskhod," 1882, No. 4; "Vtoroe Otkrytoe Pismo Aksakovu," in "Russki Kurier," 1883, No. 251, and "Vospominanie o Finlyandii," reminiscences of Finland, in "Odesski Listok" for 1883, Nos. 187, 189, 201, 202. Vengerov, Kritiko-Biograficheski Slovar, St. Petersburg, 1892.